The world of Pandora just got a whole lot bigger. 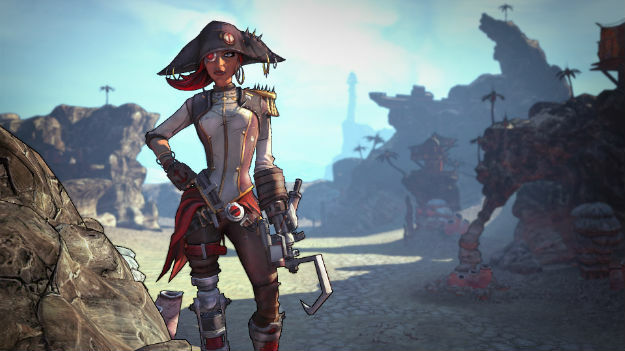 Gearbox Software launches the first full-fledged DLC offering for September’s Borderlands 2 this week, a pirate-themed high-(sand) seas adventure that wholeheartedly embraces the series’ lengthy add-on naming conventions with the moniker Captain Scarlett and Her Pirate’s Booty. The play is pure Borderlands, but the content is ripped straight from the most popular pirate tropes. You’ve got peg-legged robots. X marking the spot for buried treasure. Ornate new loot boxes that look like booty chests. Hundreds upon hundreds of “arrr” puns. And, naturally, a quest to piece together a magical compass that points the way to a long-lost treasure. Or, in Borderlands 2 terms, an assortment of loot chests filled with guns, guns, and more guns. There are really two separate layers to Captain Scarlett and what it adds to Borderlands 2. We’ll take them one at a time. First up is the add-on campaign and its assorted side quests, amounting to an easy 10 or more additional hours of hunting around Pandora’s wastes. The new DLC pack adds multiple locations for players to explore and, in a first for Borderlands DLC, just about every new loading map has a fast travel station that can be added to your master list of destinations. Much like the vanilla sequel, this first Borderlands 2 DLC pack places a strong focus on small evolutions, fixing the little, niggling complaints that dogged the first game. All of the new locations also add some fresh flavor to Gearbox’s updated take on Pandora. The DLC town of Oasis and its surrounding regions amount to a dried-up oceanscape, a sandy graveyard littered with the hulks of beached vessels ranging in size from small fishing boats to massive freight liners. There are new sandworm enemies to watch out for in the deep desert as well as a vast assortment of punny plays on bandits and loaders (aka those bipedal Hyperion robots). The enemy variants are well-conceived too. They’re re-skinned and renamed of course, but some require new strategies as well. The melee-focused “Cursed Pirate” can heal itself whenever it deals out any damage, and it uses rush tactics. The “Anchorman” enemy type, an all-new concoction, is a hulking brute that can pull you in close, Scorpion-style, with a hooked anchor projectile that shoots out toward you on a chain. Then there are Cave Crystalisks which… well, the same strategy of shooting out their leg crystals still works. But they’re blue crystals now! Also new with the DLC pack is a Sand Skiff vehicle (think Return of the Jedi‘s Sarlacc Pit scene), a hovercraft that you unlock in your very first Oasis quest. Unlike the vanilla game’s two wheeled vehicles, the hovercraft is capable of strafing around its targets, turning it into a much more effective combat tool. Unfortunately, you’ll only be able to use the new vehicle in Captain Scarlett‘s handful of new maps. There’s a lot of potential with this new ride, so hopefully Gearbox comes up with a way to make it accessible in other areas of the game, or perhaps in future DLC releases. The quest content is pretty much what you’d expect, though it’s a bit light on some of the more inventive tasks that the vanilla game puts in front of players. You’ll come across a line of quests in Captain Scarlett that task you with with locating a hidden treasure — usually marked by a well-concealed X marking — but most of the 10-plus hours of quest content is built around basic fetch and travel tasks. The writing, on the other hand, is up to the same high standard that it was in the core game, and a thoroughly entertaining cast of new characters helps to keep things from getting dull. Then there’s the other layer to Captain Scarlett, a handful of content and features built around extending your Borderlands 2 endgame. Here’s a top-level breakdown of how it all works: once you complete the DLC campaign, you unlock a level 50-ranked quest built around taking on and defeating an uber-boss (a la Borderlands 2‘s Terramorphous quest). Beat that boss and you’ll unlock another quest with another uber-boss. Think of these as MMO-style “raid” bosses, challenging endgame encounters designed to test the mettle of groups of level-capped players. Defeat these bad boys and you’ll earn Seraph Crystals which can be spent at an Oasis vendor on a new class of pink-hued weapons that rank even higher than the gold Legendaries. This feels like the start of a much bigger initiative for Gearbox moving forward. 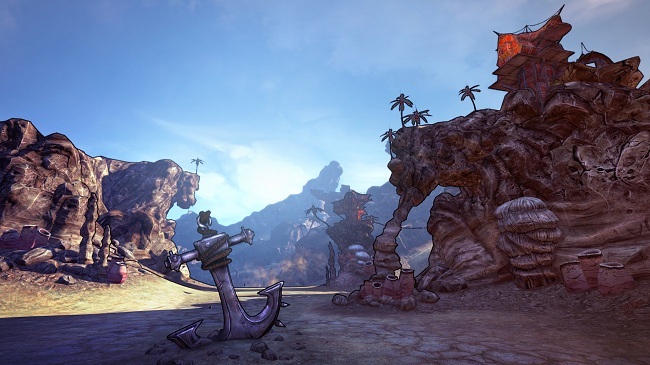 The studio’s goal with Borderlands 2 is to have players treat the game like it’s a hobby, the sort of thing that you can keep coming back to in your pursuit of greater power and more loot. Captain Scarlett‘s two raid bosses certainly support that, though I feel like there’s some balancing still to be worked out. Players can only defeat each raid boss once per day, amounting to roughly 10-15 Seraph Crystals for the two wins. Items in the Seraph store hover at around the 120 crystal cost mark, meaning it’s going to take a multi-week commitment to purchase even one of the items there. I spend a significant portion of my free gaming time playing Borderlands 2, so I feel comfortable saying that this feels a little unbalanced right now. The handful of weapons available in the Seraph store — maybe a dozen or so — are powerful, but they’re not such a huge improvement over the best Legendaries from the main game. Given the daily, multi-week commitment required to unlock even one, putting the time in to accrue enough Seraph Crystals just doesn’t seem like it’s worth the effort at this point. The two uber-bosses offer a fun challenge, no question, but the endgame economy still needs a bit more tinkering. Make no mistake there’s a ton of potential here. 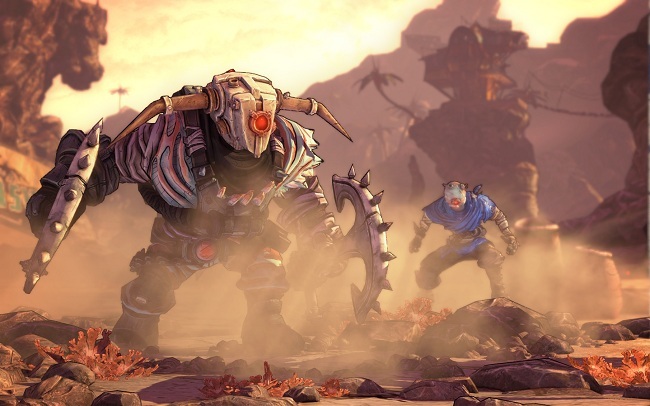 Gearbox is just scratching the surface of what is starting to feel more and more like console gaming’s answer to Guild Wars, a subscription-free MMORPG. The inclusion of raid bosses and the dangling carrot of endgame loot is tantalizing for anyone who fully embraces the Borderlands experience. I simply think that more work needs to be done on keeping players hooked. Whether that’s opening things up to allow farming each raid boss more than once per day, lowering the cost of Seraph store items, or beefing them up considerably is entirely up to Gearbox. Speaking as a Borderlands nut, I still feel more compelled to keep on working toward farming the main game’s Legendary items. Don’t count the perceived imbalance as a mark against the DLC in any way. This is essential add-on material for Borderlands 2 fans, an extension of what we loved about the September release and a first, stumbling step toward something bigger than what we’ve seen before. It’s a steal at just $10, but it’s a quality content offering no matter what sort of value you assign to it. Now if you don’t mind, I’ll excuse myself and go take on some raid bosses….